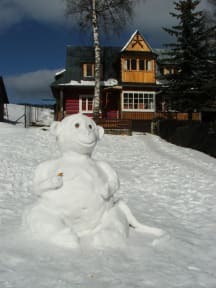 The Ginger Monkey Hostel has been set up by a couple of backpackers in the beautiful village of Zdiar in the High Tatras Mountains of Slovakia. Our price includes everything, there are no other hidden costs, the breakfast and all day tea / coffee is included and we pay the local city tax. The Hostel is cosy, friendly and feels like a home away from home, it is quite small and so quite sociable. We have various dorms and a large shared kitchen and lounge. It is a traditional building with all the comforts you have come to expect. Locally there are a plethora of activities, in the winter there is skiing / snowboarding within walking distance, ice hockey, trekking, caving, walking our dog 'Wally' and in the summer there is even more trekking, paint balling, cycling, climbing, skydiving and loads more. If this sounds too energetic you can simply chill out in the lounge, read a book or gaze at the mountains whilst drinking tea. We have restaurants and bars close by so you can get your Slovakian food and beer fix no problem, at a very reasonable price. The place to be. This hostel felt like home from the very first moment. Jack and Devon were very helpful and friendly. Ginger Monkey Hostel is on of the best hostels in Europe. One of the best hostels I have ever stayed in. Even if you just stay a few days you will start feeling at home there. Wally is the cutest and the staff was great. Absolutely nothing to complain about the rooms or facilities, free breakfast was great and starting fron Zdiar you have tons of possibilities to get to know the area and go on a hike. Perfect for a few days away from the big cities. As everybody before me I absolutely love that place! Great people, great atmosphere and amazing hiking opportunities. This place is more than just a hostel! Best hostel I've stayed at! Jim, Jack and Victoria make you feel like being home. They will give you helpful tips on hiking trips, and organize pub quizzes, poker games, joint dinner,... I will definitely come back some day! Wauw, hab mich pudelwohl gefühlt! Super herzlichen empfangen worden im süßen Ginger Monkey Hostel. Tolles Privatzimmer, mit sensationell idyllischen Ausblick. Hier kann man sehr gut abschalten und die Seele baumeln lassen. Ob bei einer Tageswanderung oder abends beim gemütlichen Beisammensein. Würde wieder dort hin kommen. The only real downside of this hostel is that any other hostel you're going to stay in will be a disappointment! Best hostel I've ever stayed in :) great people make it such a special place - amazing atmosphere!